Process heating is a key component of crude oil production. 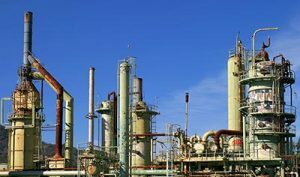 From processing materials to pumping and transporting oil, many refinery processes rely on thermal fluid heaters and heating systems. As a result, high quality, durable industrial heating systems for refineries are in high demand. Where do many facilities in the crude oil industry turn for the durable, technologically advanced industrial heating equipment they need at a price they can afford? American Heating Company! Plant managers know that their facilities can only run efficiently when equipped with reliable, durable industrial heating equipment. That’s why so many turn to the thermal fluid heating experts at American Heating Company for refinery process heating systems. Our oil refinery products provide a cost-effective solution to the needs of oil processing plants throughout the United States and beyond. Even better, when it comes to crude oil heating, we’re a one stop shop resource where you can find everything you need for your plant’s industrial heating system. For crude oil heating equipment you can rely on, trust American Heating Company. Our process heaters are durable and highly efficient with low maintenance costs. Whether you’re interested in one component or a whole thermal fluid heating system, we have what you are looking for. Serpentine Coil Technology: How Our Coil Design Sets Us Apart – Learn about the unique and innovative coil design we include in all of our standard heater designs, and find out how it could benefit your facility. Key Features and Benefits of AHC Industrial Heaters – Get the details about the key components of our industrial thermal fluid heaters that enable them to operate efficiently when used in a variety of industries and applications. Interested in pricing out our crude oil process heating equipment for your facility? Give us a call today at (973) 777-0100 or request a quote today using the form below!